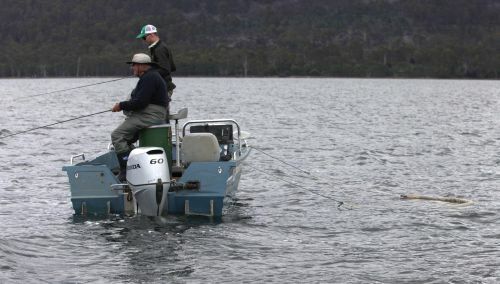 Before you charge into this article expecting to read about the best trout in Tasmania I should warn you that it relates to the highest ones not the fattest. It is also fraught with danger to write about something that may not be totally correct as there are still a few remote tarns that I haven’t got to yet and probably never will. There are also some higher places I have found to be devoid of trout that some sneaky specimens may now have swam up into. Having said all this it is my belief that the highest water in Tasmania to contain brown trout is an unnamed water at around 1290m south west of Turrana Heights. We have named it Lake Australia. It is a headwater tarn on one of several streams that flow into the western side of Pillans Lake. So drag out the Pillans 1:25000 map and follow the stream that runs up through Pencil Pine Tarn to a water roughly shaped like Australia. Now read on about how to get there and what to expect on the way. Maybe it is not for this season, but why not put it on the list for later in the year. Traditionally the age old art of fish taxidermy has involved the preserving, mounting and painting of the fishes skin and head to craft a life like trophy. In more recent times fibreglass fish reproductions or ‘repro’s’ have become available, offering the trophy hunter a viable alternative. Indeed, a well crafted repro can look as good and natural as a well made skin mount. I was inspired to touch on this subject after hearing secondhand comments that ‘skin mounts don’t last!’ That’s true if the mount wasn’t made correctly in the first place. We’ve all seen the withered and colourless mounts hanging on pub and tackle shop walls, of hardly recognisable specimens caught 20 or 30 yrs ago, and in some cases not that long ago. Well, fish taxidermy has come a long way since those days, with modern techniques and products developed specifically for the industry there is no reason why a properly crafted skin mount should not last a lifetime. Late summer brings to the fore the best of fly fishing in Tasmania, the regularity of hatches and falls of terrestrial insects makes dry fly fishing at times spectacular. These days are highlights and can be predicted with some regularity, however along with the highs you also get the lows, those ‘dog days’ where the trout simply don’t want to play. It could be they are too well fed or more sensitive to changes in the weather, or in fact simply will not feed until the hatch they can predict better than us arrives. How to predict where the fishing will be good is a key to success at this time of year particularly if you want the fish a particular style of fly fishing. When fish do start to feed make the most of the opportunities as in high summer with warm water these ‘hot bites’ may well only last a short time. I am lucky enough at the moment to be working a two weeks on, one week off roster. When I switched over to this roster I decided it was time for some midweek trips to places I have not fished a lot in the last few years. A couple of years back whilst involved in the making of the fly fishing movie The Source Tasmania I had the opportunity to meet some champion blokes. Chris Reygaert flew over from Western Australia to help his brother, film maker Nick and he stayed at my house for a week or so. He ended up moving back to Tasmania to live a short time later, and we have become good mates. I love nothing more than spending a day on the water with Chris. 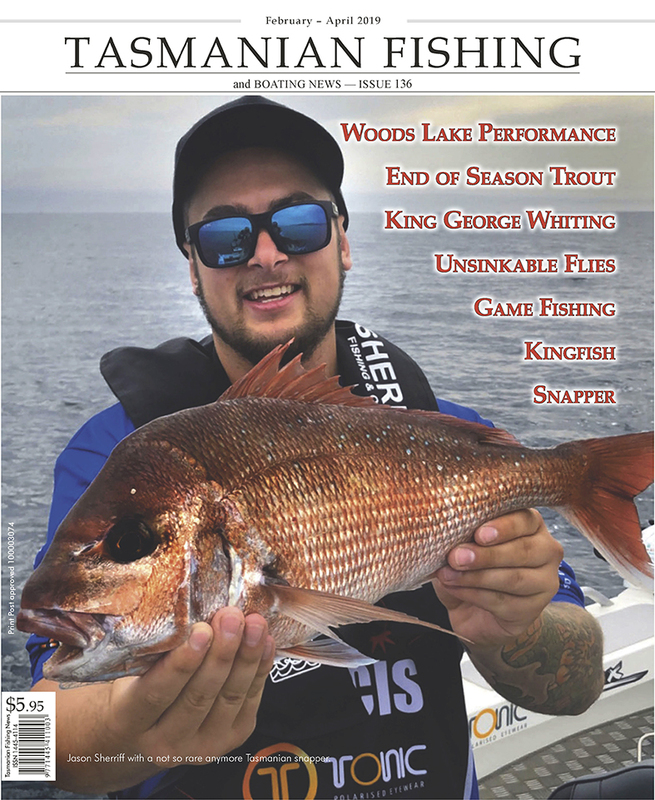 He is a very accomplished fly angler and has a brilliant eye for a great photo, which is something I am becoming more passionate about with every fishing trip. Tas Maritime Radio (TMR) has now commissioned a new multi channel marine VHF base station to provide safety coverage to the highland lakes area. It will provide a 24/7 safety listening watch on VHF Channel 16 , the distress and calling channel, and from January 1st, will be used to transmit a daily weather sked for the area at 0830 hours after an initial announcement on CH16. The predicted coverage of the base will be Great Lake, Arthur’s Lake, Lake Echo, Lake Sorell, Lake Crescent, Penstock Lagoon, Woods Lake, Lagoon of Islands and Little Pine Lagoon – and probably more. Fumbling around in the dark I finally found the mobile phone and switched off the alarm. The 3wt was set up with a new fly (I like to have a brand new fly on at the start of each fishing trip. It makes no difference to catch rates, only in my head!) and the contents of the pack checked last night. Now its time to get out of bed, have the usual hot Milo and put the waders on. That is of course after the warm thermal layers have gone on. Tasmania has some of beautiful rivers from small slow flowing waters to large rivers such as the Huon and Derwent. In this article we are going to take it back to the basics and explain the different lures and techniques for catching trout in these waters. 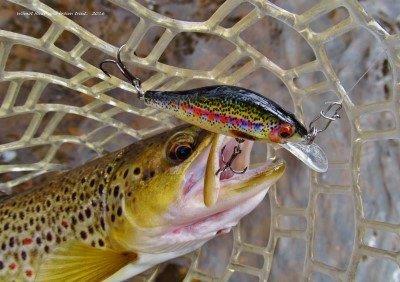 Despite your level of experience our streams offer fabulous lure fishing. You need to expect that one minute you will be fishing deep pools and 20 metres further down the river you might only have half a metre of water. The lures you use need to take this into account. After a short drive from home I pulled into the parking area I frequently use adjacent to a bridge spanning the Mersey River, my old friend. The first priority, as always, was to walk onto the bridge to have a look at the river conditions. This revealed that things were looking good with the late afternoon sun revealing a mixture of mayfly spinners and white caddis in the air above the rippling river in the soft October light. The mayfly spinners were especially noticeable with the sun glinting through their iridescent wings as they danced en-masse. Swallows, fantails and wrens were also on the wing taking advantage of the easy meal on offer. A splash or two in the river below indicated that another predator had noticed the insects as well! Today I was in two minds of whether to go and wet a line or not given the forecast was for cold and wet conditions. It was a little cloudy here and very cool but it didn't look like it was going rain for quite some time, so I decided I would go and wet a line for a few hours. This time I decided to head over to a river just to the West of home, one that I often have a session on early in the season. This river usually gives up a few browns at this time of year because there's always plenty of flow in it. During the warmer months it drops to a very low level as well as being crystal clear. I only ever fish it during the warmer months if and when we have had some decent rain. I wasn't sure what the river would be like after the record June floods either, it could be completely ruined by them. Once there it was a relief to see it was still intact, though a little wider with some damage to the rivers banks. It was running at a medium height, cloudy and most importantly it was wade-able which mattered most to me.